Many blogs -- including this one -- end each post with a call-to-action that leads to a landing page. But the question is ... are readers noticing your blog's CTAs? The problem with static CTAs at the bottom of each blog post is that after a while, visitors learn to tune them out. This isn't only a problem with your repeat visitors, either -- since so many blogs implement this tactic, even your new visitors might be ignoring your "additional content" or "recommended next steps." Convert more website visitors into leads. Try HubSpot's free email capture software today. To combat this, some blogs have started to implement something called a slide-in CTA. Ideally, this CTA will enter the screen below your sidebar content so it doesn't cover it. If you don't have a sidebar, it'll simply slip right in on the right side once it's triggered. Do These Slide-In CTAs Actually Work? When we first implemented slide-in CTAs on our blog, we decided to run some tests to find out if they we're actually working. Clickthrough rate (CTR) - What percentage of blog post visitors clicked each CTA? Conversion rate (CVR) - What percentage of the people who clicked ultimately converted on the landing page form? Submissions - How many leads did each CTA ultimately generate? In this test, the slide-in CTA had a 192% higher CTR and generated 27% more submissions. The number of submissions actually wasn't higher, because the CVR on the slide-in CTAs was lower than the static CTAs. But the volume of clicks was so great that it was worth compromising on CVR. Keep in mind that the success rate of any CTA will have a lot to do with your specific audience, so we encourage you to run some tests of your own to determine if slide-in CTAs are the right fit for your blog. 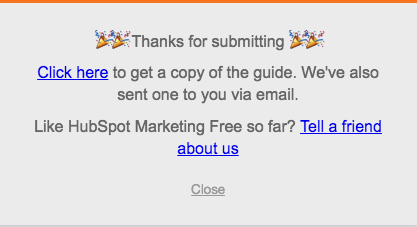 A free HubSpot account (sign up here). If you don't have access to #1, email this article to your webmaster so he or she can setup HubSpot's free marketing tools for you. You can do the rest. 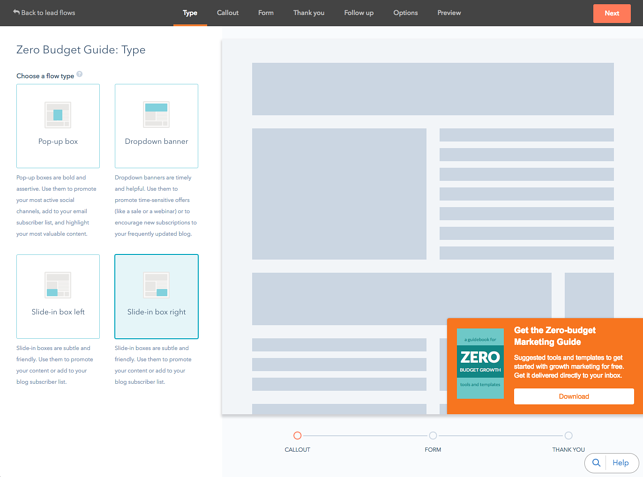 1) Install HubSpot's free marketing tools on your website. 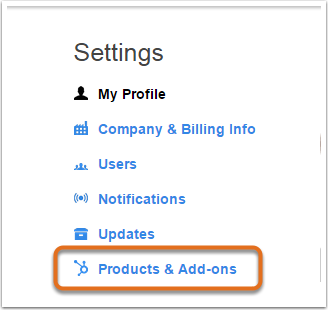 If you use HubSpot to host your website, you can add Lead Flows (pop-ups forms) as an add-on in Products & Add-ons by following these instructions. 2) Create a Lead Flow and choose "slide-in box" as the type. 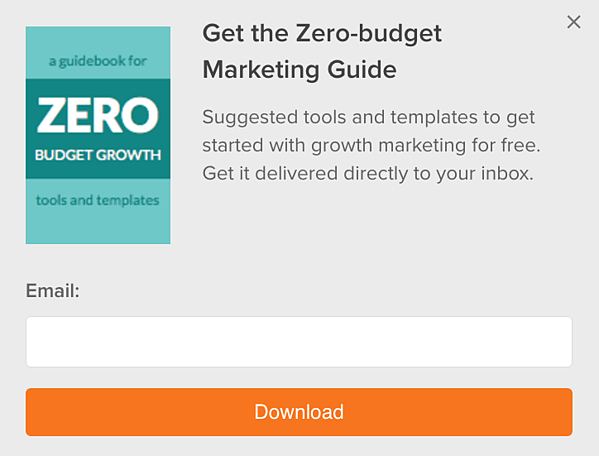 Once you have HubSpot's free marketing tools (or Lead Flows in your existing HubSpot portal) all set up, you'll want to start by creating a Lead Flow -- an all-in-one conversion pop-up that allows you to target your audience with specific content. To access the Lead Flows editor, click "Lead Flows" in the top navigation, then "Create Lead Flow." After that, it's time to craft your actual "callout" or CTA. 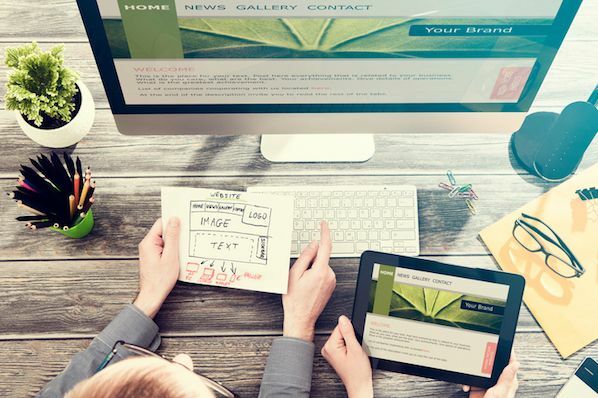 Your CTA provides an opportunity to grab your visitor's attention with a brief description of what you're offering via a title, description, image, and theme color. Upload an image (also included in the form step). Set your callout text (the main header). Adjust the button text (also included in the form step). Set the theme color which will be included throughout the Lead Flow. Still with us? Good. It's time to build your form. Within the form step, you can add additional fields to the form, change the language of the fields, and add a body to elaborate on the value you are providing with your Lead Flow. Language allows you to change the language of the non-editable parts of the CTA, including the form field labels. Currently, it is possible to translate these parts of the form to French, Spanish, Japanese, German, and Brazilian Portuguese. Lastly, create a thank-you message that your visitor will see after submitting your form. Within the "Flow Options" section, you can adjust the location of your flow, the triggers that will cause it to appear for your user, and more. First, you can adjust the internal name for your Lead Flow or unpublish it if needed. When naming your CTA, keep in mind that this is the name that will appear in your contact timeline and in internal email notifications. Next up, configure which pages you'd like your flow to appear on. You'll notice that the 'exact match URL' option in HubSpot Marketing Free supports a wildcard option. For reference, a wildcard is a character like an asterisk that serves as a placeholder for a character or group of characters -- for example: "http://www.website.com/blog/*". So if you'd like your CTA to appear on all pages on your blog, make sure you add that "*" at the end. Page scroll. This will trigger the moment your visitor scrolls 50% down your page. Elapsed time. This will trigger the moment X seconds have past (minimum of seven seconds). Lastly, you can enable/disable internal email notifications for new submissions on this Lead Flow. With notifications enabled, you'll receive an email whenever a contact is captured. You can also connect your free tools to an email provider (more on that here). If you have HubSpot's free marketing tools connected to a provider you can select which lists new contacts that submit this Lead Flow will be pushed into. 4) Preview & publish your CTA. The Lead Flows editor provides an interactive preview where you can test each stage of your Lead Flow and see it in action. This preview offers the ability to view on desktop, tablet, and mobile. When you're ready to publish your Lead Flow, simply select the blue "Publish" button in the top right. Need to unpublish it for some reason? Head into the "Options" tab and you'll find an "Unpublish" option at the top. You can also unpublish right from the Lead Flows Dashboard. Whew, we're finally done. You did it! Excellent work. Now let us know how it goes. 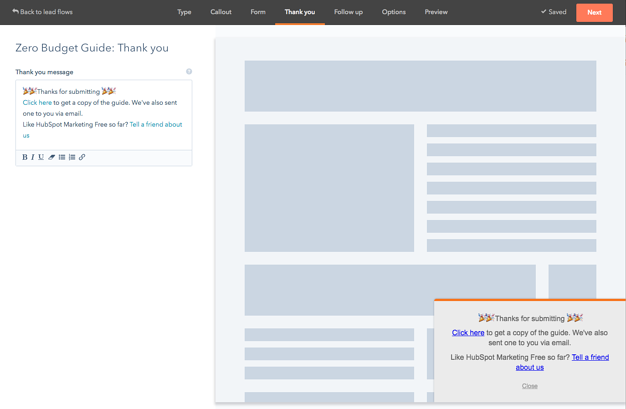 Have you experimented with slide-in CTAs? Share your tips and tricks in the comments below. Editor's Note: This post was originally published in April 2014 and has been updated for freshness, accuracy, and comprehensiveness.